Last week I passed the half-way point of my project here in Lima, so it seems a good time to reflect on the six months that have been and to consider what the rest of my year here may bring. It hasn’t been easy. Really: under-statement. As some of my posts have documented, I’m struggling with the day-to-day reality of life here, as well as with the bigger issues of environmental management and social justice in Peru. On the daily level city living just isn’t for me. I dislike crowds and noise, and enjoy spending my time hiking, gardening and interacting with my local community. Here I’m caught in a city of almost 10 million people, bang smack in one of the driest deserts on the planet. The city is an enormous sprawling beast of concrete and snarling traffic jams, growing rapidly as squatter-towns spring up on the urban fringes. The only green places are the manicured parks in the wealthier suburbs and I miss the mountains and wild places so readily accessible back home. 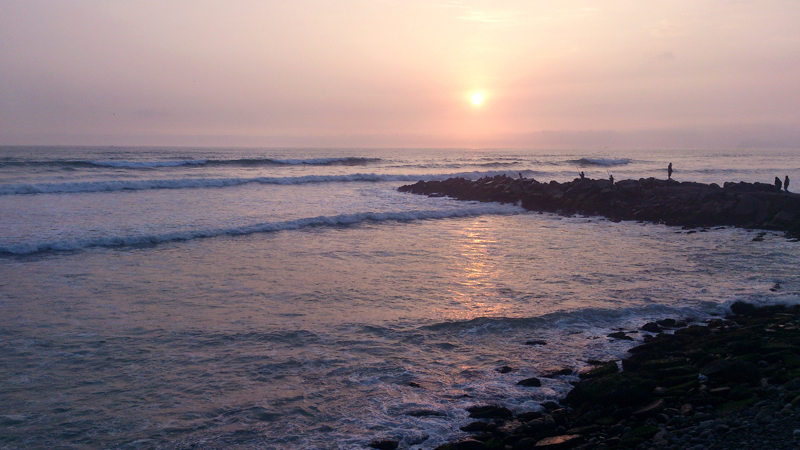 Coastal suburbs wrap around the remains of mud-brick temples from a very different era in Lima’s history. Getting around Lima is complicated by the anarchic mini-bus network, the mad traffic, the inadequate infrastructure and the sheer mass of people. It can take an hour to travel 10 km. Peru can be a dangerous place and there are suburbs I can’t visit unaccompanied, and whole districts I can’t enter at all. Getting OUT of Lima is a grand logistical challenge and it’s a good 4 hour trip to get to anywhere green, which really limits your options, and unless I can convince local friends to come and guide me through the chaotic transport system (run by a myriad of small operators and collectives) I’m stuck with taking tours or hiring a driver, which can be very expensive and isn’t exactly my favourite way to travel. Consequently I don’t get out of the city nearly often enough. Lima is NOISY. Crazily-sensitive car alarms go off constantly, set off by passing vehicles and even pedestrians just walking by. Drivers trapped in the interminable traffic vent their frustrations by horn. There’s construction everywhere. There are SO MANY PEOPLE, everywhere is crowded and people push to fit through walkways and footpaths that can’t cope with the numbers. We spill onto the roads and dart through the traffic. It’s dusty and polluted and too many nights you can’t see the stars. The city has its good sides: there’s a lot of energy here; there’s music and dancing and art and emerging sub-cultures and creativity, but for me it doesn’t make up for the costs. Lima wears me down. Old colonial grandeur slowly crumbles in heart of the Peruvian capital. Work – my volunteer project – sometimes lifts me back up and other times drags me down further. I’m working on environmental management systems for Peru’s network of national parks and reserves, so I deal with complex issues on a national scale. That’s a big, depressing scale at times. I read social and environmental impact studies and research papers that tell me just how bad things are: Madre de Dios River in the Amazon is so mercury contaminated from illegal gold mining that local women are miscarrying; glaciers are retreating and disappearing due to climate change diminishing water availability for the majority of the population; Ica aquifer is turning saline due to over-extraction of groundwater to grow asparagus and red globe grapes for international export markets. I know the stats*: 25% of the population here is living in poverty, and poverty here means a one-room, dirt-floored shack in the city slums or a hand-build adobe hut in the freezing sierra: it means living without plumbing or electricity in many cases, or even access to safe drinking water. In rural regions over 15% of the adult population is illiterate, and if you can’t afford a private school the education received is barely rudimentary. People have been so disempowered and socially disconnected that the social fabric breaks down in places. There is no community in the Lima slums; no local organisation or coordinated efforts to make improvements, just a learnt helplessness and expectations that someone else must be responsible for fixing things. Work occasionally brings me face-to-face with corruption and political interference in environmental management. I see the exploitation and the institutionalised racism and disadvantage and the lack of resources to adequately enforce the existing laws which undermines the limited protections that have been hard-won. It can be confronting and demoralising and sometimes I wonder why the hell I’m even here. The distance between the dusty squatter-towns to here in Miraflores is physically short but psychologically enormous. There are good days though. There are small victories. There’s holding people to account and standing up for decisions that are ethically right. There’s building scientific understanding that will support better decision-making. There’s introducing accountability measures into project management and establishing documented, systematic approaches. There’s a creativity and a freedom to try new ideas and give things a go that doesn’t exist back home. There’s meeting passionate, switched-on Peruvians who are committed to building a better future, one that’s greener, kinder, fairer and more sustainable. These people – my friends, my colleagues – give me hope that, with time and effort, the future here in Peru can be brighter. My project may only be tinkering with tiny ideas at the edges, but you have to start somewhere and it may as well be here. For this, I will survive six more months in Lima, and I will get out of the damn city to explore the soul of this mad country as often as I can. For real change, though, Peru needs access to better education for everyone: only then will more people be empowered to build a critical mass for sustainable change to grow the brighter future so many are hoping for. This is Peru’s great challenge, and I am becoming more and more convinced that the impetus for change needs to come from within. I don’t really know, yet, if or how I fit into that. This beautiful but maddening country needs to listen to its youth and learn to drive change from within. just wanting to say a grateful ‘thankyou’ for your posts ..I feel really lucky that a coupla bugs in my garden provided entry to your blog of heartfilled words and breath removing images. all the best to you. Hello and thank YOU for such a lovely comment. I write this blog to share my experiences and hopefully encourage others to step a little more lightly and act a little more kindly. I hope you stick around as I have some places I want to talk about, with photos that are really something. Then at the end of the year it’ll be back to blogging about gardening in Hobart again! I have different feelings with this blog. You are rigth my friend. I know that. But… (because always there is a BUT) you know it is only one way to watching the things. One color glasses. I know that Lima (and Peru) it is noisy. Cities in this country are crowed mass…. But some little places (and people in those little places) are building real changes. And, people like you are very important to do that. We need learn about other places, other worlds, other universes. Thanks to be here my friend…. Amigo, eres uno de las personas quien me dan la esperanza que el Peru puede mejora. Planificamos un tour de los buendos proyectos y comunidades ejemplores, por favor? jajajajaja… You must pay for it… jajajajaja. Let me put in order my schedule, to prepare a City Cultura Tour. I’m fascinated by what you have to say, by a perspective based on actually being there rather than mine of watching from afar. Keep being positive, keep doing things and let us know if there is anything we can do to help and support the change-makers. I love Peru but the damn country keeps on insisting on breaking my heart, so it’s a troubled relationship and I’m struggling through second-phase culture shock at the moment (where you start to run up against the deep differences in values), so I’m a little more down about things than usual. There is SO MUCH potential here, but cultural, political and socio-economic factors keep it from being realised. Peru needs to change itself, but before that can happen, people need to start believing that real change IS possible (without another attempt at socialist revolution & domestic terrorism…). That history of terrorism, plus institutionalised disadvantage and discrimination (against those with stronger indigenous roots & cultures), plus the history of colonialism and decades of corrupt and nepotist governments, has lead to deep disempowerment of the people. Add to that various cultural traits – Inca culture featured an infallible ruler, small elite & large subservient peasantry; many Amazonian cultures are isolationist; the sheer number of tribal cultures and races in Peru, and the fact that no-one in Lima is FROM Lima – and it’s very difficult to generate grass-roots social movements. It sounds like you need to do some positive things for your own sanity. You are a better woman than I am – I don’t know that I could bear it all. Good luck with finding those grass-roots movements – I’m sure there must be some out there. Must be pretty confronting…. I was in Sydney over the weekend and the amount of homelessness there compared to Melbourne is frightening, it’s everywhere in the city, you can’t not notice it. I can’t imagine what it would be like being in a place like Lima. This comment has made me think about how little homelessness I’ve seen here. I guess when you can find places to throw up a shack without any building permits, made from whatever materials you can find, it’s not such a problem (mind you, it’s not much different to being on the street…). Or perhaps I just haven’t been to the right places yet. There are less beggars than you would expect too, mostly as the lack of labour laws means you can scrape a living somehow. Something I should research more and write about! And yeah, it never gets really cold here in Lima, though I’ve had a few cold nights in tents up in the sierra, where it does drop below 0 and the altitude makes it all the chillier. Please drop by again some time! I’ve got to admit to not being Tassie born! Although both my parents are Tasmanians, I was born & grew up on the Mainland. Did my first year abroad at 17 with the student exchange thing, before heading off to uni and then settling down south in the family seat. Mi experiencia seria lo más pobre si no te hubiera conocido, amiga. Voy a extrañarte un montón.